Vibrant colors and exquisite detail set these frost proof ceramic or porcelain tile mosaic apart from the rest. 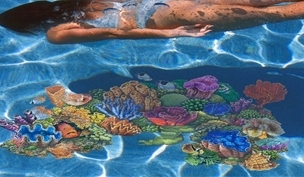 Frost proof swimming pool mosaics are unparalleled in quality, ease of installation and affordability. Coral Reef Scene A Multicolored 58" x 33"
Coral Reef Scene B Multicolored 21" x 15"
Coral Reef Scene C Multicolored 36" x 24"
Coral Reef Scene D Multicolored 22" x 22"
Coral Reef Scene E Multicolored 26" x 29"
Reef Fish Clown Fish Multicolored 8" x 4"
Reef Fish Emporer Angelfish Multicolored 8" x 5"
Reef Fish Regal Angelfish Multicolored 8" x 5"
Reef Fish Saddle Butterfly Multicolored 9" x 5"
Reef Fish Raccoon Butterfly Multicolored 9" x 6"
Reef Fish Moorish Idol Multicolored 12" x 7"
Reef Fish Moorish Idol Double Multicolored 12" x 9"
Reef Fish Redfin Butterfly Multicolored 9" x 6"
Reef Fish Treadfin Butterfly Multicolored 9" x 6"
Reef Fish Treadfin Butterfly Multicolored 9" x 5"
Octopus Red 24" x 24"
Crab Red 12" x 8"
It's 5 O'Clock Somewhere Blue 50" x 17"
Pool Party Blue 30" x 12"
Foot Print Brown 10" x 8"
Leather Sandals Brown 10" x 8"
Pineapple Drink Blue 8" x 6"
Martini Drink Blue 8" x 5"
Bikini Floral Yellow and Blue 27" x 33"
Bikini Floral Brown and Blue 27" x 23"
Bikini Red 25" x 22"
Sea Turtle Green 24" x 24"
Sea Turtle Brown 24" x 24"
Masterpiece Light Accent 28" x 42"
Masterpiece Medallion 42" x 42"
Pool Supply Unlimited has a variety of high quality frost proof ceramic and porcelain tile mosaics and high performance Aqua Decals for swimming pools. The possibilities are endless in creating one-of-a-kind mosaic creations, including custom logos and graphics.